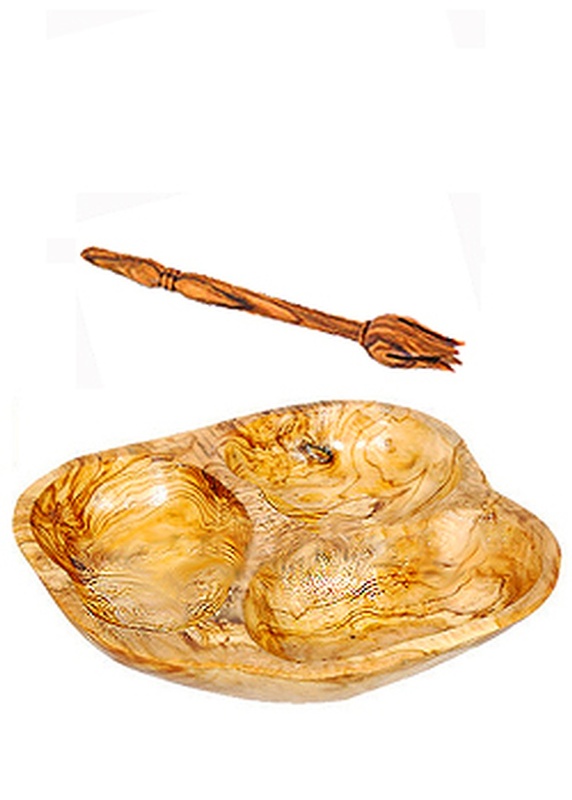 A beautiful dish with three compartments is handcrafted from one piece of Tunisian olive wood with your table in mind. The design of this dish makes it ideal for use with various types of olives, crudites, nuts, or even as an individual tapas / mezze dish. A little fork also made from olive wood accompanies this dish. The pieces are extremely durable, and the beautiful tight grains in the wood add elegance, beauty, and uniqueness to every dish. This item is hand-carved and beautifully polished to a very smooth finish Tunisia. The wood used to produce our olive wood collection comes to us by sustainable and environmentally conscious methods. These products are made from the wood of trees that no longer produce fruit, or from the tree trimming/pruning after the harvest season. In addition, new trees are regularly planted to maintain the region's natural balance. Care instructions: Cared for properly, olive wood can last a lifetime. To ensure your product stays in optimal condition, be sure to hand wash only, and never place it in a dishwasher. Never soak olive wood in water. Once a month, it is recommended that you rub the olive wood gently with a coat of olive oil to prevent it from drying out. Keep away from direct prolonged sunlight, and avoid using in extremely hot foods. Use only for cool or warm foods.